There have been rumors that Hideo Kojima is leaving Konami. Those rumors, claims Metal Gear singer and voice actor Donna Burke, are allegedly true. Donna Burke sang the breathtaking “ Heavens Divide” for Metal Gear Solid: Peace Walker. More recently, she sings “Sins of the Father” for Metal Gear Solid V: The Phantom Pain and voiced the iDroid in Metal Gear Solid V: Ground Zeroes. A talented singer, she’s also cut tracks for an array of games and anime for various companies, and she continues to release solo albums. Burke is not a Konami employee. Even though things seem very, very strange between Konami and Kojima, Otsuka and Burke continue to urge fans to support the game, which the creator apparently is still involved with. Continuing, Burke wrote, “They are still working for sure and the game is being tested now and some bits finished off to make it awesome.” We’ve heard the claims Burke is making before. They are not new. However, this is the first that someone involved with Metal Gear Solid V has commented in a public forum to this extent. Hideo Kojima has been quiet, and his video podcast was cancelled. 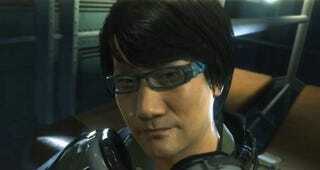 In the past, Kojima was an active Twitter user and often uploaded photos. Now, his Japanese account seems to be used only for retweets. Kojima is uncharacteristically silent. Konami acknowledged that internet use for Metal Gear staff has been restricted, but would not comment on whether Kojima was a full-time employee or a contract one. Previously, he was an exec at Konami, but doesn’t appear to be one anymore. If true, going from top brass to a contract employee, having your production company shuttered, and seeing your name removed from something you created would be one hell of a demotion and a humiliating thing for anyone to go through. Burke also claimed that the rumor about “power struggles within the Konami” is accurate. I agree, Konami- I should be more accurate. “Don’t throw away the last 5 years because Konami changed the contract status of a genius” Konami is correct in that Kojima has not actually been fired. As I stated previously he and his team are still working hard on getting the game out. My sincere apologies to Konami, Hideo Kojima and the fans for giving the wrong impression. I was trying to add my voice to Otsuka-san pleading with the fans to not abandon MGSV because of the stuff happening at Konami and to throw my support behind Kojima and everyone who has worked over the last five years and is working to make this game the greatest ever. This is true. Kojima himself confirmed in a statement that he was still “100% involved” in the completion of The Phantom Pain, and was “determined to make it the greatest game I’ve directed to date.” So my apologies for upsetting you all.